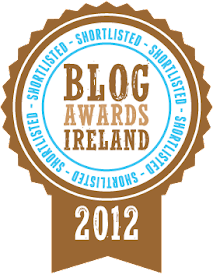 If you're following me on twitter, you may already know that this blog has been shortlisted for Best Science\Education Blog in the 2013 Blog Awards Ireland. If you're not following me on twitter, why not? This blog is joined in the shortlist by many other excellent blogs including last year's winner Science Calling, Beyond the Wild Garden and Inside the Brain. While I have to question the wisdom of lumping science and education together in a category, I'm delighted the blog has been shortlisted. The awards will be presented at a ceremony on October 12th. Good luck all! Friday 20th September is Culture Night in Ireland and all around the country, people will get to see behind closed doors, hear beautiful music, see fantastic art or visit a museum out of hours. In conjunction with Cork Skeptics, I'll be giving a talk on culture night on the importance of plants to society and culture. 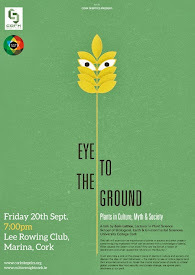 The talk is entitled: Eye to the Ground: Plants in Culture, Myth and Society. As we know, humans exist because plants exist. Plants have shaped our world, allowing animal life to evolve and they continue to have an overriding influence on our society. From the food we eat, the medicines we take, the beer we drink and the clothes we wear; plants make life possible on Earth. In this talk, I will examine the importance of plants in society and even unearth some intriguing mysteries which can be solved with a knowledge of plants. What caused the Salem witch trials? Why are the British a nation of tea-drinkers and what caused the ‘Mutiny on the Bounty’? 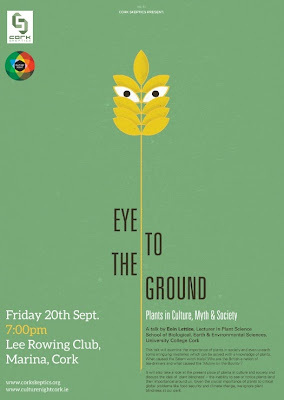 I’ll discuss the present place of plants in culture and society and discuss the idea of ‘plant blindness’ – the inability to see or notice plants (and their importance) around us. Given the crucial importance of plants to critical global problems like food security and climate change, we ignore plant blindness at our peril. This talk is free to attend and open to everyone. It starts at 7pm on Friday 20th September, 2013 and takes place at the Lee Rowing Club on The Marina in Cork City, near Pairc Ui Chaoimh. 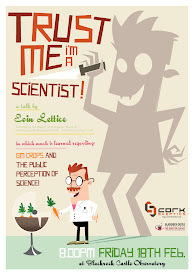 Note: this is a change from the usual Cork Skeptics venue. For more details and a map to the venue, see the Culture Night Cork website. Last weekend saw the final event in the hugely successful Taste of West Cork festival in Skibbereen. A huge festival market ended the festival's 10th season which has been one of the most well attended yet. I was in Skibbereen the weekend before to take part in some of the first events of this year's season. 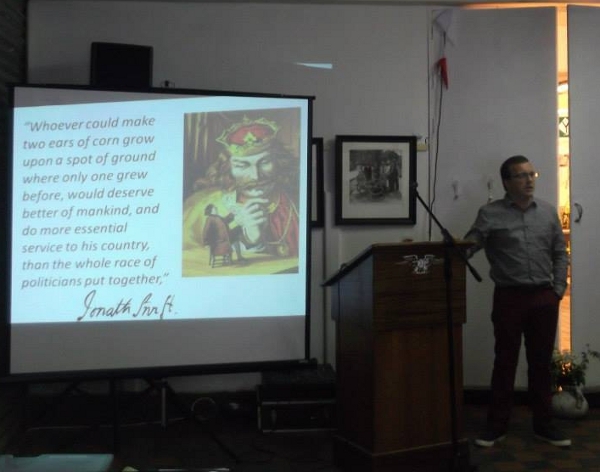 Having talked specifically on the potato last year, I was asked back to give a broader talk on the importance of plants as sources of food and their central place in human society. 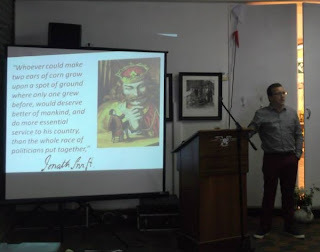 "Harvesting the Sun: How plants make food" was well attended and I thoroughly enjoyed the very plant-orientated focus of the Growing Awareness project of which my talk was a part. Having borrowed an old bakery premises from Field's supermarket (itself a reminder of how important plants are for our 'daily bread') the organisers set to work creating a festival box office but also a lecture space and a huge exhibition highlighting the importance of plants for food. The Growing Awareness exhibition was the result of many hours hard work by so many organisations and individuals. It was great to see my own students from the UCC MSc Organic Horticulture class, based nearby, making a contribution. The result was an accessible, vibrant and interesting exhibition on plants that will contribute to people's awareness of how important plants are to society. The organisers are to be commended for their foresight and hard work. Who said chemistry wasn't fun? A University College Cork video has been shortlisted by Times Higher Education (THE) as one of the best videos submitted for the World University Rankings. The public will get a chance to handle some ancient fossils, meet slithering reptiles and view some amazing carnivorous plants when the School of Biological, Earth & Environmental Sciences at UCC throws open its doors for Culture Night 2013 on September 20th. 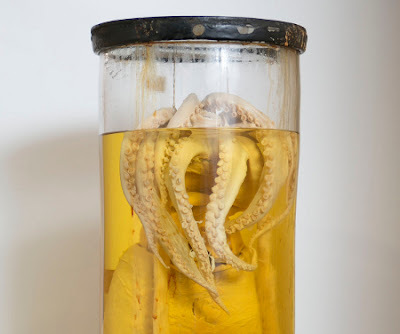 This is the first year that BEES has participated in Culture Night and visitors will get a chance to see some unique animal specimens collected by Charles Darwin himself during his famous voyage aboard the Beagle. The School of BEES is one of just a tiny number of institutions worldwide that houses Darwin specimens. BEES Culture Night organiser Tara Duggan says there will be lots to see during the family-friendly event: "Starting at the historic Cooperage building, once part of the Jameson Distillery, visitors can tour our geology garden, wind turbine, fish ponds, greenhouses and laboratories. They can also try their hand at some experiments and step back in time while browsing the exhibits of our natural history museum and dinosaur fossils". Throughout Culture Night BEES staff and students will be giving rapid-fire talks and showing short films about our environment and the world-leading research going on at BEES. For full details on Culture Night in Cork, see the Culture Night Cork website.